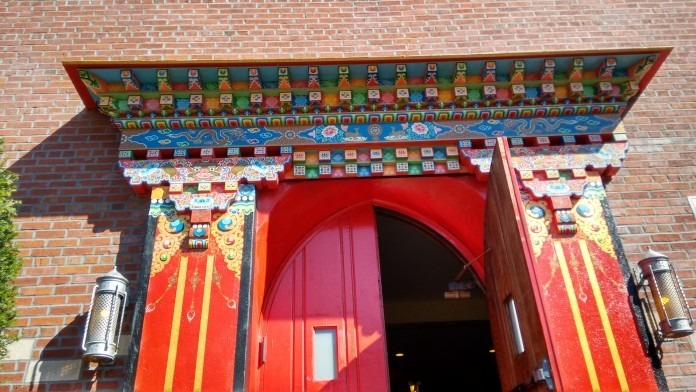 Buddhist temples like this one run by the United Sherpa Association are catering to the growing Nepali community in Jackson Heights, Queens. 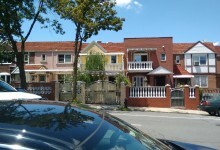 When the Queensboro Corporation laid out garden apartments in Jackson Heights almost 100 years ago, its owners strictly prohibited non-whites from living in them. Fast forward to 2017 and Jackson Heights is now one of the most diverse places in the country. One neighborhood census tract alone, which spans just three blocks from 83rd to 86th streets, is home to immigrants from 51 countries who speak 21 different languages, the Daily News reported. And in Jackson Heights today, there are 167 languages spoken, according to WNYC. 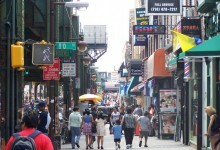 One of the newer immigrant groups to settle in Jackson Heights is the Nepalis. This new population traveled 7,500 miles from home and family to Queens, motivated by both political turmoil in their country and the hope of economic opportunity in the U.S. The Nepalis of Jackson Heights are following the well-established path of immigrant groups that have gone before them: settling into a new home, adjusting to an unfamiliar culture, and beginning to join community boards, parent-teacher associations, and advocacy groups. There is no way to accurately assess the number of Nepalis living in Jackson Heights right now but the 2010 census put the number at 5,000. This number is estimated to be four times that by community members who say that since Nepali is not listed as a separate identity on the census survey, many simply checked “other,” and some never filled out the forms. Many Nepalis fled to Queens between the mid-1990s and 2006 amid the bloody, decade-long Maoist insurgency that led to the abolition of the country’s monarchy. Most of the people who fled seeking political asylum were young and came without their families. According to a study conducted by Adhikaar, an advocacy group for Nepali speakers, the migration was also fueled by the “diversity visa” lottery that allowed people from countries without high rates of immigration to come to the U.S. as permanent residents. 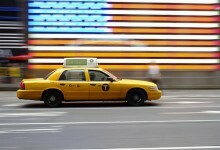 In their estimation, more than four out of five Nepali-speakers in New York City immigrated in the last two decades. Tara Niraula is an advocate for the Nepali community in Queens. Why did they choose to come to Queens? To Jackson Heights? Niraula came to New York from the Tehrathum District, which is the Northeastern hill region of Nepal, just over 25 years ago. Niraula studied at Columbia University's Teachers College, eventually earning his doctorate there. He identifies himself as an “educator and community advocate” and is eager to introduce New Yorkers to his community's culture, religions, and way of life. Nabin Sherchan, owner of Mustang Thakali Kitchen, one of the Nepali restaurants in Jackson Heights, explains that he chose the neighborhood because, “I feel comfortable here." He adds that he also misses his country. One of the first things that Niraula wants visitors to understand is that the Nepalis in Jackson Heights, and the rest of the U.S., are not one monolithic group. Nepal is an extremely ethnically diverse country and Niraula says that there are more than 120 languages spoken there. The exterior of the United Sherpa Association building. The two most prominent religions in Nepal are Hinduism and Buddhism but there are others as well, including some that center on a celebration of nature. 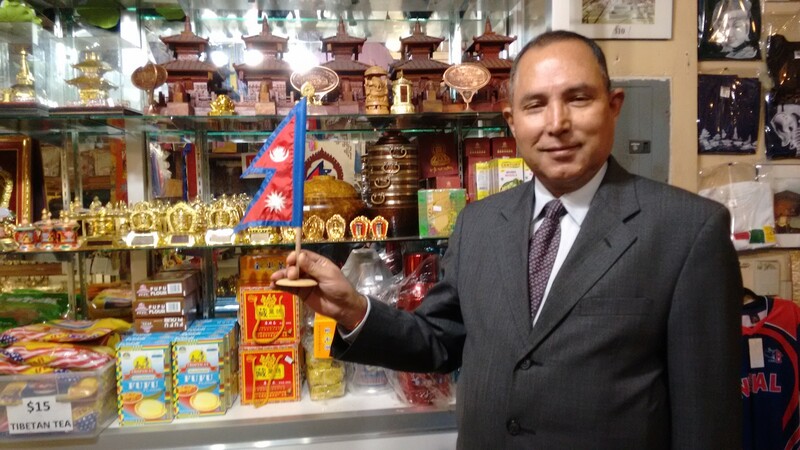 Hindus and Buddhists are closely bound together and, in one local shop, Niraula pointed out a photograph of a Hindu temple and a Buddhist temple in Nepal that are connected to each other. The Sherpas, who are Buddhist and most widely known as mountain guides in the Himalayas, are the largest group of Nepalis in Jackson Heights. 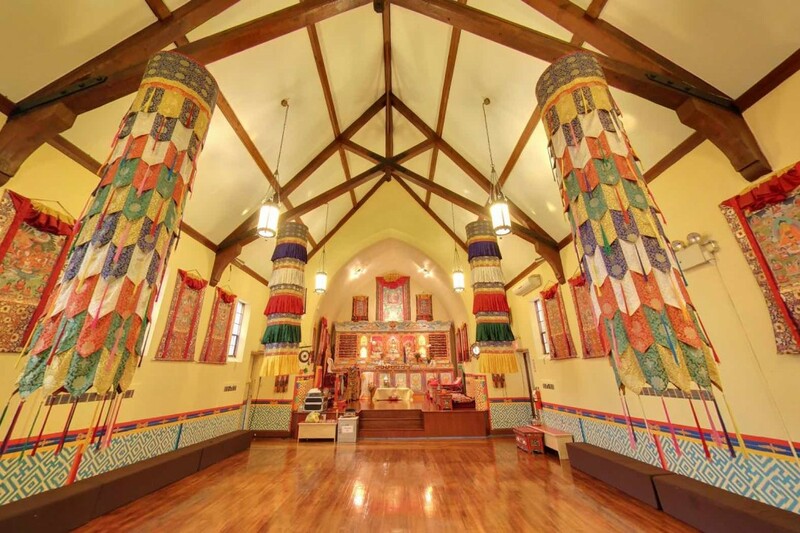 They have their own temple, the United Sherpa Association, at the corner of 41st Avenue and 75th Street, in a former Lutheran church. The hand-painted and -crafted carvings on the door of the temple are stunning, especially since they stand in stark contrast to an otherwise undistinguished brick building. The interior of the building, stripped of its pews and decorated with flags, colorful textiles and rugs, gives visitors a brief but beautiful introduction to the Nepali aesthetic. Besides being a place to worship, the building hosts classes in language, religion, and culture. On a recent visit, about 10 seniors, mostly women dressed in the traditional long, embroidered dress of their home country, sat at a table while a young Nepali woman taught them the names of the body parts in English. Two years ago, this same temple was the setting for a prayer service for the 16 Sherpa guides who were killed in an earthquake-triggered avalanche in the Himalayas. The official language of Nepal is Nepali, a language based on Sanskrit. There are now four Nepali language publications available in Queens, with editorial content in Nepali and ads in a mix of English and Nepali. What are the issues the community faces? Niraula says that, like many of the other immigrant communities in New York, Nepalis are worried about the Trump administration's immigration policy. “When one group is targeted, all communities feel the shock,” he says. Jobs and language are both an issue for the community, as well as family issues that arise because families have been are separated, with many wives and children and other relatives still living in Nepal, he adds. Unable to transfer educational credentials and work experience from Nepal to the U.S., and struggling with a new language, many newly arrived Nepalis take jobs that are not commensurate with their training and skills. The group Adhikhaar (the word means “rights” in Nepali) advocates for these workers, most recently by participating in coalitions set up to protect domestic workers and promote a healthier nail salon industry. Walking in Jackson Heights in October, a visitor can’t miss the signs in the shop windows advertising “Diwali Sales.” The five-day holiday of Deepawali (the Nepali name for the holiday, known as Diwali by other South Asian communities) began on October 17th, a date that changes each year and is determined using a lunar calendar. Deepawali is a festival of light, a beginning of the Hindu New Year, and a time to worship Lakshmi, the goddess of prosperity and generosity. Both Buddhists and Hindus celebrate the holiday, with festivities centering around the home. “Temples are for worship and the home is the place for more intimate holiday rituals,” says Niraula. Although the foods served in homes on Deepawali vary from family to family, sweets are always an integral part of the celebration. Don't miss the momo truck. Nepali cuisine features some of the same staples as the food of the country's neighbors, Tibet and India. The most common meal is thali, a word that actually means the round, usually metal platter that it’s served on. A thali meal includes rice, dal bhat, a thick lentil soup or stew, and vegetables or meat and chutney. A favorite Nepali snack is the momo, Nepal’s version of the dumpling, filled either with veggies or meat. Momos are said to have originally been transported across the mountains by the wandering monks who introduced Tibetan Buddhism to the Himalayas. 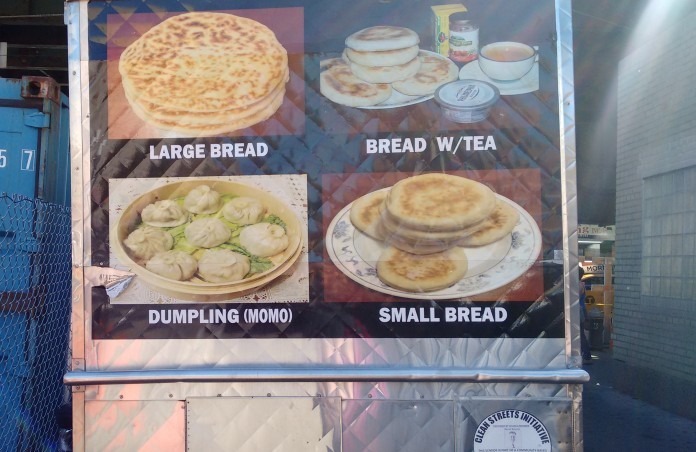 If you’re in Jackson Heights and are hit with a sudden craving for momos and have neither the time or inclination to go to a restaurant, there’s a momos-to-go food cart parked a few steps from the 74th Street station. A popular Nepali dessert is sel roti, a ring-shaped sweet made of rice flour and featured at many festival meals. Often described as a donut, this ubiquitous snack is larger and thinner than a Western-style donut, and is widely available to go in Jackson Heights. You can get the ingredients for momos or sel roti and other Nepali dishes in any of the Indian stores in Jackson Heights, including the huge 74th Street branch of the national supermarket chain Patel Brothers. There’s no uniquely Nepali grocery store in Jackson Heights, but at the Himalaya Connection cousins Nima Lhoba and Saraki Dolma Sherpa stock pickles, salt, and spices imported from their home country. The crowded basement store also sells Nepali incense, masks, textiles, jewelry, hand-carved crafts, and other Nepali products. There is also a growing number of Nepali restaurants in Jackson Heights. Sherchan's restaurant Mustand Thakali Kitchen has a calm interior and peaceful vibe. Thakali is the name of the principal ethnic group from Mustang, a valley on Nepal’s northern border. Thakali food is vegetarian-heavy but Sherchan’s menu includes fish, beef, chicken, and goat, as well as the Thakali specialty of yhosi, a plate of mashed buckwheat, chicken, vegetables, and chutney. Have a craving for yak? Yak sausage and yak momos are on the menu of the popular Himalayan Yak restaurant. Before you walk into Himalayan Yak, give yourself a few minutes to admire the exterior of the restaurant. Its elaborately carved wooden doors and windows may be an anomaly on the streets of Queens, but they are typical of the temples and historic buildings in the Kathmandu Valley. The Himalayan Yak is one of the few places in the city where Nepali and other Hindi musicians perform on a regular basis. The restaurant hosts live music events every Friday, Saturday, and Sunday night. According to Daniel Karatzas, associate broker at Beaudoin Realty Group and author of Jackson Heights: A Garden in the City, “Prices [in Jackson Heights] have risen dramatically in the last five years, as more people have become aware of the quality of our housing stock, true neighborhood feel, proximity to Manhattan, and excellent access to public transportation and local highways,” he says. Most apartments for sale are co-ops, some built as such in the 1920s and 1950s, and most of the houses were built prior to 1940. Places in the Jackson Heights Historic District (roughly the area from 76th to 88th streets between Roosevelt Avenue and Northern Boulevard) have a higher price tag than those outside of it. 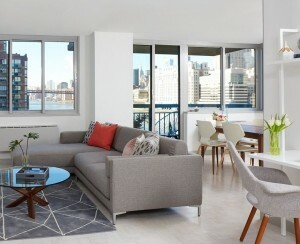 One recent listing is in the Berkeley, a historic district co-op at 35-25 77th St. 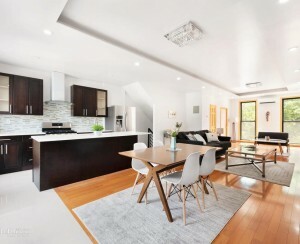 The approximately 1,150 square-foot two-bedroom, one-bath apartment has an open layout and has been “lovingly renovated,” according to the listing. The asking price is $658,800. On 73rd Street, a one bedroom one bath in a prewar building, with a dishwasher and hardwood floors, is renting for $1,950.